To patrons, it’s all about the show. But for large venues such as a museum, arena or convention center, the focus is squarely on the guests: keeping them safe, satisfied and eager to return. Thanks to today’s mobile economy, hospitality venues must be both more proactive and more responsive than ever, dispatching staff to wherever they are needed to deliver an outstanding and memorable guest experience. But many venue managers and their highly mobile workforces still communicate about news, updates, task assignments and other critical content via radios, which are squawky and disruptive and cause delays while staff members wait for shared channels to clear. Now wearables in venue management are radically transforming how hospitality operators orchestrate everyday operations such as shift changes, maintenance checks, VIP visitor alerts and any activity that can be checked off of a list. Sleek, unobtrusive wearables, such as the Samsung Gear S3 smartwatch, enable instant, discrete voice and text communication. Staff can work hands-free, while staying connected to systems such as task management and facilities management, via messaging and voice communications. Wearables for staff communication can transform hospitality operators’ ability to monitor and manage their environment, allocating staff quickly to just the right places to ensure the guest experience always meets or exceeds brand standards. Cincinnati/Northern Kentucky International Airport, for example, uses the Samsung Gear S3 wearables platform and IoT to manage cleaning staff’s response to restroom usage times by equipping janitorial staff with Samsung Gear S3s and installing counting sensors in restrooms. Whenever a restroom has been used by 150 guests, cleaning staff are instantly notified that it needs to be cleaned. 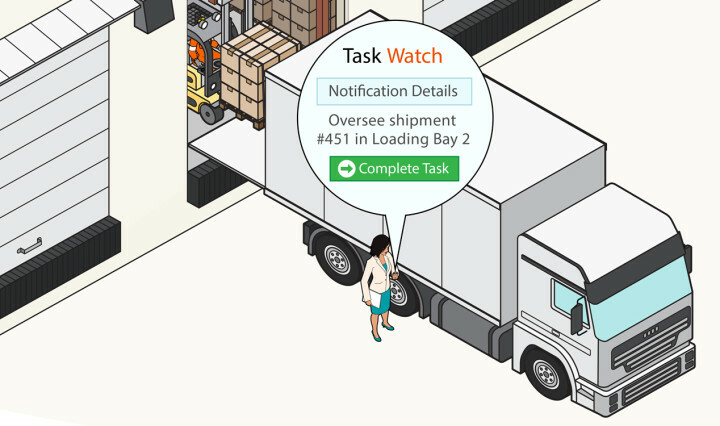 Learn how wearables with task management apps let you respond to business needs in real time. Food and beverage workers can cross-communicate via push-to-talk with colleagues at other kiosks to request additional supplies or staff for a location experiencing high demand. Facilities managers can get alerts right on their wrists when a walk-in freezer falls out of range and dispatch a repair technician. Hospitality staff can receive discrete alerts when a VIP enters the venue, and quietly excuse themselves to go greet the guest. Security staff can exchange secure, private messaging about a potential trouble spot. Maintenance dispatchers can locate and notify the closest technician to an urgent repair need, discussing the requirements along the way. The housekeepers working closest to the site of an urgent cleanup task can quickly be re-assigned to address the issue. Operations staff can quickly gather staff to respond to an arriving delivery. At Houston’s elegant new Hotel Alessandra, Samsung Gear S3 wearables and Hipaax TaskWatch software has increased staff efficiency, reducing the need for operators to handle call logging and dispatching. It has also enabled streamlined, quiet communication that allows Hotel Alessandra to serve guests quickly, boosting guest satisfaction while maintaining the property’s quiet ambiance. “There’s a lot of excitement from both employees and managers because these devices simplify internal communication between employees, and from room to targeted employees. It’s so effective,” says Safet Dokara, director of operations at Hotel Alessandra. In addition to the devices themselves, wearable platforms streamline communications management across the hospitality organization. Samsung’s Knox Configure, for instance, enables venue managers to easily and securely automate the configuration of wearable devices. Then, using Integrated Enterprise Mobility Management (EMM) from Samsung SDS, they can control their entire fleet of wearables on one central console via the cloud, communicating to an individual, group, all staff or any combination of those as needed. In addition, they can manage wearable features, monitor device locations and, via the Samsung Knox security solution, even remotely lock down devices, restricting use to only those apps needed for their specific tasks. Wearables also streamline communication costs. They can be configured to connect directly to Wi-Fi for easy communication, without needing to be tethered to a smartphone. Devices used outside the venue can also use cellular networks. Satisfying today’s digitally empowered guest is more challenging than ever. By leveraging seamless, hands-free communication, wearables promise to transform venue management by improving back-end operations, enabling efficiency gains and driving higher guest satisfaction. Learn how you can impress your guests and streamline operations by checking out our latest hospitality technology solutions.